Today I want to talk about ISBNs what they are and why you may actually need one. To begin, ISBN stands for International Standard Book Number which is basically a 13 digit number that is assigned to a book which identifies its “bibliographic data” (title, edition, publisher etc) to book sellers and lenders. Whether indie authors even need an ISBN is a contentious argument that has indie authors on a shoestring budget wondering if this is just another unnecessary expense. So today, let’s cut through the crap and see what why you may, or may not need an ISBN for your book. Myth #1: Indie authors who are only publishing eBooks need not worry about ISBNs. Fact: Not true, places like Apple, Sony and Books a Million won’t allow eBooks in their stores without an ISBN. Also, libraries won’t even consider eBooks without ISBNs. Myth #2: You can purchase ISBNs from anywhere. Fact: There is only one place in every country where the owner/publisher of a book can purchase an ISBN. Places that offer packages or discounts on an ISBN usually are buying in bulk and probably not reporting the books bibliographic data properly. It would be wise to purchase an ISBN on your own. It’s the difference between someone buying your book, or accidentally purchasing yet another copy of Harry Potter. Seriously, J.K. Rowling doesn’t need the money! Myth #3: You can’t buy an ISBN after a book’s been published. Fact: You can indeed purchase an ISBN after a book’s been published. Myth #4: You don’t have to buy separate ISBNs for a book translated in multiple languages. Fact: Sorry, you do need different ISBNs for each translated version. Myth #5 Barcodes and ISBNs are the same. Fact: Barcodes identify either price, size or even color of a product, ISBN’s identify publisher, edition etc. CreateSpace assigns books with ISBNs but only Amazon’s KDP assigns ASIN (Amazon Standard International Number) numbers to their eBooks for the sake of their database. 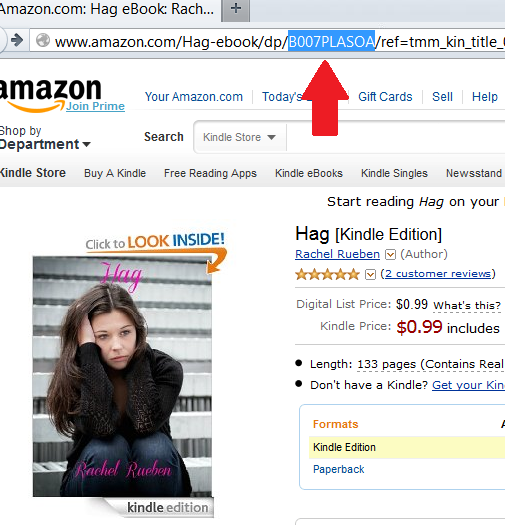 You can capture the ASIN number of any given book in the URL Amazon assigns each book. As nice as that is, you need an ISBN for your eBook as well one for the print edition of your book. Sorry, there’s no easy way around this expense. If you want to have your books in libraries, brick and mortar stores, and even “non-Amazon” websites, you must buy an ISBN for your eBook. Before you spend money on this special number, you need to consider how far you want to go with your book. Do you want to sell your books on your website or at conferences? If so, an ISBN is an unnecessary expense. I hope I cleared this up for you, if you know a newbie who needs this info, feel free to share this post with them. This is not an endorsement for Smashwords, although I have found them very easy to work with. If you want your digital editions available from Amazon, you can still publish through KDP (at no up front monetary cost to you), but those will not carry the same ISBN of the others and will only be available from Amazon, although except for the applicable note in the front matter, the two editions may be identical. That’s the problem, if you want your book in a library or brick and mortar store then your book needs an ISBN with the complete metadata otherwise, they’ll have a problem cataloging your book in their database. These services that offer ISBNs are often buying them in bulk and not assigning your book with the proper metadata. Also, companies are over charging authors which I find absurd. Having an ISBN is a business decision that most authors don’t really care about but if they want to expand their book’s distribution, purchasing an ISBN is a necessity. Good info there Dave! Definitely will be checking this out for my next book. I was suggested this blog by my cousin. I’m not sure whether this post is written by him as nobody else know such detailed about my trouble. You’re amazing!